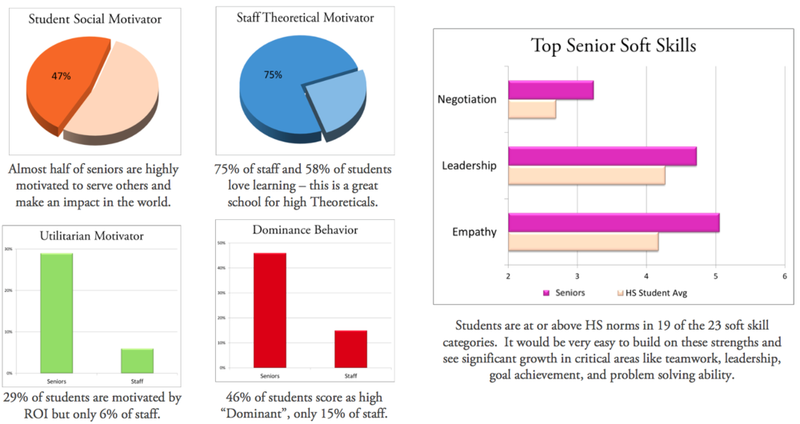 We measure, track and analyze data trends from your school or program. We also track big data and longitudinal observations for education nationwide. See examples below. Click here to view a sample analytics presentation. Indigo adds each school’s data into an ever-growing database of insights and information about how schools operate. As we work with more and more schools, it is revealing some surprising trends in education. Here are the insights that are beginning to emerge. The educational system rewards a specific subset of behaviors but Discourages innovation. The education system demands conformity. Students who follow rules and don’t talk in class perform the best academically. This system discourages innovation and independent thought. Student and staff Creativity scores are well below adult averages. Students with high Creativity scores found few outlets in their educational setting to express and act upon ideas. mental health issues are an epidemic. More than 1 in 5 students were identified from Indigo’s “Blue List” as needing extensive social and emotional support. Despite overwhelming need, there is little to no support as counseling staff is stretched and schools are hesitant to incorporate social and emotional learning due to academic time constraints. but have a wide variety of motivators and skills. 90% of teachers are behaviorally patient and steady, and only 1 in 7 are urgent and driven. Given this environment, schools need at least one leader with a natural propensity for driving change. Many schools do not even have one individual on staff with these behavioral qualities. Over 20% of students are entrepreneur candidates – the system marginalizes their potential. Students frequently identified as “difficult” by school counselors were high potential entrepreneurs. Because less than 5% of teachers have Utilitarian motivation, learning is generally disconnected from return on investment (ROI) and the real world. Schools also lack extracurricular activities and classroom subjects that appeal to entrepreneurs.